Waterlily is rooted with round leaves that have a notch in them. Water lilies grow in bodies of water with soil or silt on the bottom. 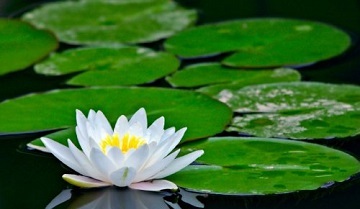 Their large round leaves and solitary flowers float on the surface of the water. The leaves have veins that form a radial pattern and a notch on one side that keeps the leaf from being a complete circle. The flowers can range in color from yellow to pink to white. This plant is not to be confused with Water Hyacinth, which unlike water lilies, has a floating root system and tall purple flowers. Can grow in all areas of the United States. Produces new plants on the ends of stolons. Can spread very rapidly. We recommend a herbicide such as Dibrox® herbicide to get rid of water lettuce. These products can be purchased on our website.